View real reviews from our photography clients. Next Wave Studios will capture that special moment for your wedding, engagement, family, beach, or commercial event. "Thank you so much for photographing our wedding. We are so thrilled with the pictures. You captured the unique spirit of our wedding so well. It was like you "got us" from the moment you arrived! Let us know if we can ever serve you as a reference. You are AWESOME!" As my wedding approached my fiancé and I realized the photographer we had chosen was not going to work for us. With only a short time left until our wedding we were referred to Kyle, and we feel so lucky! Kyle was so reassuring and accommodating considering we were planning this from another state . After seeing photos on his website we were convinced we had chosen the right person.. As wedding day, approached the weather was looking more and more ominous Kyle was more than flexible, and gave excellent weather predictions! David and I and our families could not have been more thrilled with the end result! The pictures were beautiful and the experience with Kyle was really fun! He had great ideas for pictures and was really quick at getting all of the family pictures done so we could get to the fun pictures and on to the reception! 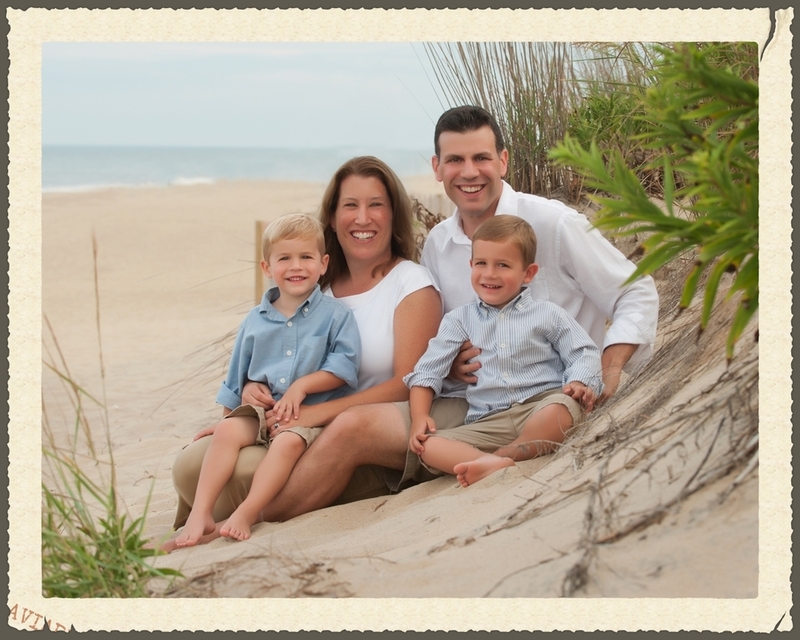 We think Kyle Hughes is your only choice for Eastern Shore photography! of making what we thought would be difficult choices with all the photos that you took. Kyle Hughes has been taking my children’s sports photos for the past 8 years. I’ve always admired how calm he is with large groups of small children. A couple of years ago I asked him to take our family portraits and couldn’t have been happier with the results!! For days we tried to get the perfect “beach/dune” photo, but the weather and wind weren’t cooperating. Kyle decided to run out to the family home in downtown Berlin and check out the lighting in the backyard by the old Magnolia tree. Within minutes he called and said it was PERFECT, and for the family to meet asap! With 4 generations of Baker’s in their comfort zone of HOME, the photos were more than AMAZING!! We lost our Patriarch, Gramps, shortly after the photo shoot~ I love seeing his smiling face with his Son, Grandson and Great-grandchildren framed throughout our house. Thank you Kyle for creating a wonderful memory for our family. My family has never had a professional portrait taken and knew this summer would be the best opportunity since our son will be going off to college next year. The decision to hire Kyle Hughes from Next Wave Studios proved to be one of the best moments of the year. He was amazing in choosing the perfect backdrop setting for all our pictures and had a "Dr. Doolittle" way in working with animals, as we chose to have our family dog in the picture. The pictures are amazing and the overwhelming response of compliments we've receive on the quality and professionalism of the photographer have been exceptional. Kyle created the ideal setting taking into consideration such elements as native areas of dune grass, white sand, and blue ocean water in the background and captured the perfect scene for our picture. The Kralls could not be more satisfied and pleased with the entire experience. We highly recommend Next Wave Studios for your family. It's one of the best investments we've made. Hope this Email finds you well and enjoying the holidays! What a wonderful Christmas we had as a result of your great job last summer. We all will enjoy the beautiful pictures for years to come. Thanks again for the outstanding job and care you showed to our entire family! Hope 2015 is the best year yet and we will do our best to send you some new customers!